Our most popular 3-D slide viewer! For all 1 5/8" x 4" (41mm x 101mm) Realist-format slides - including glass mounted, European format, and all half-frame size 3-D slide mounts. See Catalog Shopping List for larger quantities. 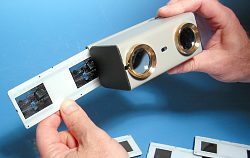 A focusing, illuminated stereo slide viewer for "Realist Format 1 5/8" x 4" (41mm x 101mm) stereo slides. Originally designed and produced in the early 1950's, this compact modern design includes a focus adjustment (no interocular adjustment), and accepts cardboard, plastic or glass mounted "Stereo Realist" (5-sprocket format) size 3-D slides. The internal illumination automatically turns on when the slide is inserted, making it ideal for passing around to friends. A safety switch turns the light off if a slide is left in, and the viewer is set down on a flat surface. Made of durable white plastic, with quality plastic lenses. Two "D" batteries are required (not included). You asked for it! 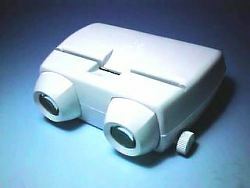 A reasonably priced Realist-Format 3-D slide viewer with QUALITY ACHROMATIC GLASS LENSES! This one has a light weight plastic body. Simply point the diffuser at a bright light source and you are ready to view. No batteries needed! The LuxVue is a simple, fixed-focus viewer, but the large 24mm diameter achromatic glass lenses assure quality viewing for virtually everyone. 60mm focal length offers approximately 4.5x magnification. For "Realist Format" 1 5/8" x 4" (41mm x 101mm) cardboard, RBT plastic, and metal mask stereo mounts that are NOT in glass. This viewer WILL NOT work with (no longer made) EMDE or Realist Aluminum masks that are sandwiched between two glass sheets and tape bound, or are in the metal glass binder frames! The one-piece stereo slide mount simply slips into the viewer from either side. This viewer is not for standard 35mm (2" x 2" or 50mm x50mm) slide mounts. To see a viewer for this format click on No. 2035 LuxVue-2x2 3-D Slide Viewer for details.